The Sand Tiger Shark is also known as the Grey Nurse Shark and Ragged Tooth Shark. These large-bodied fishes have a deceivingly ferocious look. Contrary to popular belief, the sand tiger shark is not related to the tiger shark. In reality, they are quite peaceful and relatively harmless unless provoked. They can grow up to 3.2 meters and adults can weigh around 200 Kilograms. These sharks prefer the tropical and subtropical waters in coastal areas of the Atlantic and Indian Oceans and also found in the Mediterranean Sea and Adriatic Sea in depths from 20 to 200 meters. They belong to the lamniform order of the Odontaspididae family of sharks. Although the Sand Tiger shark is a solitary creature it sometimes can be found in groups of 20 or more. They are listed as vulnerable creatures by IUCN (International Union for Conservation of Nature) because of their low reproduction rate. They previously were fished and hunted around the globe but are now protected in most areas. Sand Tiger Sharks are fast swimmers and can swim at a speed up to 12 miles per hour. This is the only shark species known to come to the surface and gulp air. The air is stored in their stomach. They use it to float motionless while hunting to keep their prey unaware. This shark frequently swims with its mouth open which makes their appearance more vicious. They like to creep around shipwrecks as they generally hunt on the sea floor. Declan, Tobin. " Sand Tiger Shark Facts for Kids ." Easy Science for Kids, Apr 2019. Web. 21 Apr 2019. 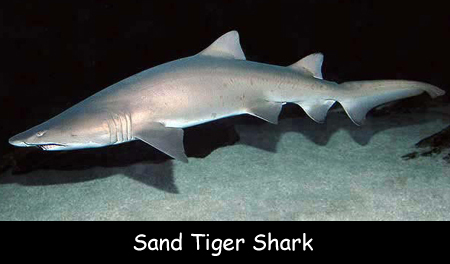 < https://easyscienceforkids.com/sand-tiger-shark/ >.